When we speak for ourselves, this is sometimes called speaking in the 'I' or using 'I statements'. This is where we own our statements and views about things but do not presume to be able to speak for others. We do not assume they hold the same views and so do not speak in a way that implies others agree with us. Communication often breaks down because words are used that state opinions or interpretations or feelings or thoughts as 'facts'. For example, I was doing a workshop the other day and a discussion of the word 'respect' came up and a participant said that "Respect has lost its original meaning, it's been taken over by government spin doctors and now doesn't have the same integrity and meaning that it used to have'. I identified that this may be true for him and that the word does not have the same integrity and meaning for him that it used to, but others may have a different understanding of the word and so it is not a fact that respect has lost its original meaning, just that it has for him. Others in the group did then speak for themselves and expressed different understandings of the word, for example that it represented a form of reverence towards another person, a valuing of the person and what they have to say and of their views. We didn't have to get into a discussion about which interpretation was 'wrong' and which was 'right' as there was an acknowledgement that words can mean different things to different people and that sometimes even a dictionary does not resolve that. Travelling on the underground is horrible. It will be miserable again today, it's going to rain. Going to work is a burden we all have to suffer. The people who live in this town are not very sociable. Mathematics is a very difficult subject to study. Speaking in this way can often lead to destructive outcomes to a conflict as the speaker assumes that their view of the world is shared by everyone and they make decisions based on this assumption. Ownership of any such decision is therefore taken from those who may have a different view as they are not even consulted as a result of the speaker's assumption that their subjective viewpoint is a 'fact'. When we are in a destructive conflict, and even when we are not, there can be a lot of ‘speaking for others’ going on in our heads. We can assume that we know what others think about us, or what they will be saying to each other about something, or how they will react to an event, or what they think about an issue or a situation. In neighbour disputes there are frequently highly inaccurate assumptions by the parties involved about what their neighbour thinks, has said, wants, what their motivation is for doing what they do (it is usually seen as calculated and malicious). And these practices transfer to most dispute situations. Quite incidental actions are ascribed malicious intent and are seen as part of a structured, co-ordinated attempt to bring misery to the person observing the actions. In all of these situations those involved are speaking for others. The only way to know what someone thinks or feels or wants is to ask them. Then they can speak for themselves. They may not have an answer. If they don't have an answer, how could we ever have had the answer? Or, we may be accurate in our guess about what they think or feel but we will only know by asking them. That doesn't mean we ask them: "Do you feel tired/jealous/angry?" if we think they are tired/jealous/angry as that is still us speaking for them, putting words in their mouth which they then have to agree or disagree with. It doesn't leave them much option as they are still having to respond within our range of answers. If we ask 'How do you feel? they can create their answer entirely for themselves and speak for themselves and may come up with very different words to describe how they feel to those we assumed. Or they may not feel able to answer at that time. Any pressure from us to do so is still a sign of us wanting to control how they express themselves, to speak for them. It's not hard to use open questions which allow any answer to be given. But often we have a resistance to this as we are still wanting to control what others say and so we limit this by using closed questions. We want to speak for the other, instead of allowing them to speak for themselves. Some people then say "But they were struggling to express themselves, I was just trying to help". What this misses is that the need for them to be able to express themselves is the listener's and not the person speaking. If they have no phrase that works for them that is fine, it will come in time for them. Or not. It also misses that even if the speaker does take up the offer of a word or phrase given by the 'listener', they did not speak for themselves and ownership of what has been said about their difficulty has been diminished. This contributes to their burden in dealing with their situation as they feel less able to control what is happening. Someone else has started to take it over and they now have that to worry about as well. This is also true for 'body language' interpretation which is often presented as a way of understanding what people think or feel. I think that many wild misinterpretations of situations occur because people believe they have been able to 'read' someone else's non-verbal behaviour. They speak for the person rather than ask the person directly how they feel or what they are thinking? "You could tell from his body language that he was angry so I wasn't going to speak to him"
I wonder how isolated that person felt who was displaying the 'angry body language'. No-one seemed to want to talk to him. In this video Byron Katie goes deeper into the impact of 'speaking for / thinking for' others when she talks about any answer she gives being her own rather than one based on what she thinks someone else wants, or is thinking, or how she projects that they will react to what she says. She focuses on her own thoughts and leaves others to focus on theirs as a consequence. This is what she often refers to as 'being in her own business' and not trying to be in others'. When I was a teacher, a common practice with children who had continuously or seriously misbehaved was to call them to a meeting with their parents and the child's form teacher and the Head of Year. A range of 'commitments' were made by the child to act differently in the future and perhaps these were even written down as a record of what the child 'agreed' to. And yet the child hadn't agreed to anything. The teachers and the parents would say something like: "Now Johnnie, we know you don't like Mathematics and that you get frustrated in the lessons, but we think it would be a good idea if you agreed to not call out in class, not swear at the teacher, not turn up late for lessons, always do your homework... etc. etc." And then Johnnie would be asked "Do you agree to that?" and Johnnie would grunt "Yeah". "Well that's great Johnnie, I'm glad we could all come to some agreement and way forward about that". Of course two days later, Johnnie has transgressed about 3 of the things he 'agreed' to because he never agreed to them in the first place. Pretty much everyone spoke for him, he certainly didn't speak for himself and little if any ownership was expected of Johnnie to create ways of improving the situation himself. His feelings and views were expressed for him and he was volunteered to act in certain ways through closed questions, which predefined what he was able to 'say', and he was then just required to say "Yeah" to it. Ineffective communication, ineffective conflict resolution. With children in particular, such practices are advocated simply 'because they are children' and they 'can't express themselves'. Which is simply a regurgitation of what the adult saying it experienced when they were children. I've seen many children resolve their disputes without the need for adult intervention. See the Comments page for a real life example. I've seen many adults who've 'learned' that they can't resolve their own disputes. Similar underlying thinking is used to advocate the practice with 'difficult adults'. And so it continues. 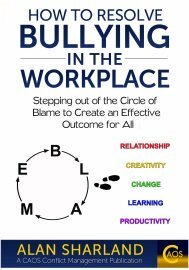 Instead of resolving the conflict through empowerment of all involved, it suppresses it through attempts to control the person with whom there is difficulty, which is ultimately disempowering and ineffective for all concerned. And if we consider schools to be about learning, then it teaches children that when they are in a dispute or difficult situation, they will be told how to respond to it, and that resolving it themselves is not the way. I don't consider that a very effective education. Transforming Conflict is an excellent organisation based in the UK that supports practices in schools that enable children to resolve their own conflicts. Adults learn a lot from their work too. Speaking for others, making statements about people or things or situations as if they are facts rather than accepting that we are only speaking for ourselves in what we say, are destructive responses to conflict and can serve to either maintain a destructive conflict or even escalate it. 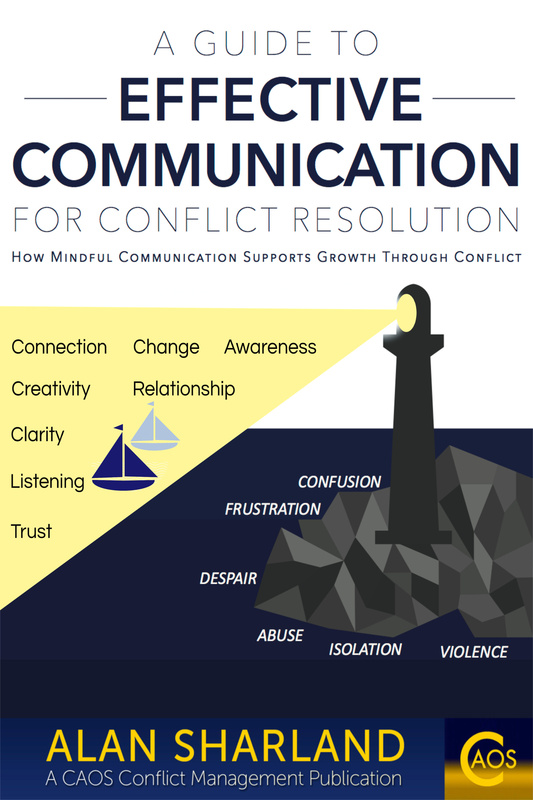 It is ineffective communication and it is highly ineffective as a means of resolving conflict. But please keep remembering - it is ok to make mistakes. If we can observe this in ourselves and learn new ways of responding which recognise the importance of enabling others to speak for themselves, then we have increased the effectiveness of our own communication, increased our capacity to help others in resolving their destructive conflicts and increased our capacity to resolve our own. The use of open questioning in order to support this is discussed in the Conflict Resolution section of this website.